These two photographs show an exterior and an interior view of Griffin and Son Men's Furnishings and Drugs in Nortonville, Kansas. In the exterior photograph a horse and carriage is visible outside the store. 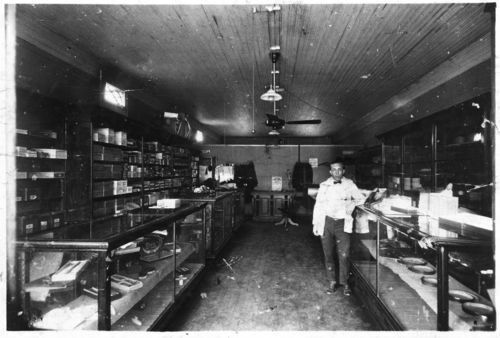 In the interior photograph the general merchant J. R. Jeffrey is seen standing next to display cases of items for sale. Holding Institution: Nortonville Centennial Committee, 1973.